First, thanks for all the sweet comments on my last post! They definitely made me feel better about the race. As promised, here’s my recap. It’s wordy. Sorry. I spent the Friday and Saturday before the race at a conference for work. Timing was great because the conference was in Loveland (where the race finished), so I didn’t have to stress about getting to packet pick-up on time. The conference was excellent, and I had lots of professional things to think about, so my mind was occupied with things besides my usual level of pre-race nerves. That was nice. Packet pick-up was out at Sylvan Dale Guest Ranch, which is a special place to me because that’s where J and I had our rehearsal dinner. Last year’s floods caused a lot of damage at Sylvan Dale (including wiping out the building in which we had our dinner), so I was happy to see that they were receiving some financial kickback from the race. There was no expo, just bib and shirt pick-up, which was totally fine with me. I grabbed my bib and shirt, asked the (very nice) volunteers a few questions about the shuttle the next morning, and was on my way in just a few minutes. I headed back into Loveland and checked into the hotel, then went for a walk to loosen up my legs while I waited for Jordan to arrive (he had meetings in Denver at the same time as my conference). When he got there, we grabbed some spaghetti from Noodles and Company, then went back to the hotel to swap conference stories and try to relax. I went to bed super early and, of course, didn’t really sleep. The alarm went off at 3:45 the next morning. Ouch. I got dressed, ate my bagel, peanut butter, and banana, and threw on my ugly warm-up clothes. Jordan drove me the 15 minutes to meet the buses (he’s a good husband), and soon I was drifting in and out of sleep on the drive up the canyon. Soon, we arrived at the start in front of the famous Stanley Hotel. I waited on the warm bus for as long as possible, then stood in the porta-john line, worrying as the 6 a.m. start drew ever nearer. I needn’t have worried, though: two of the buses got lost, so the race start was delayed. Finally, the race director said a few words, and then we were off! We started down a steep downhill, but I tried to keep it reeled in, especially since I almost always start races too fast. Mile one ticked by in 7:33, which is right where I wanted it: about 20 seconds slower than goal pace. 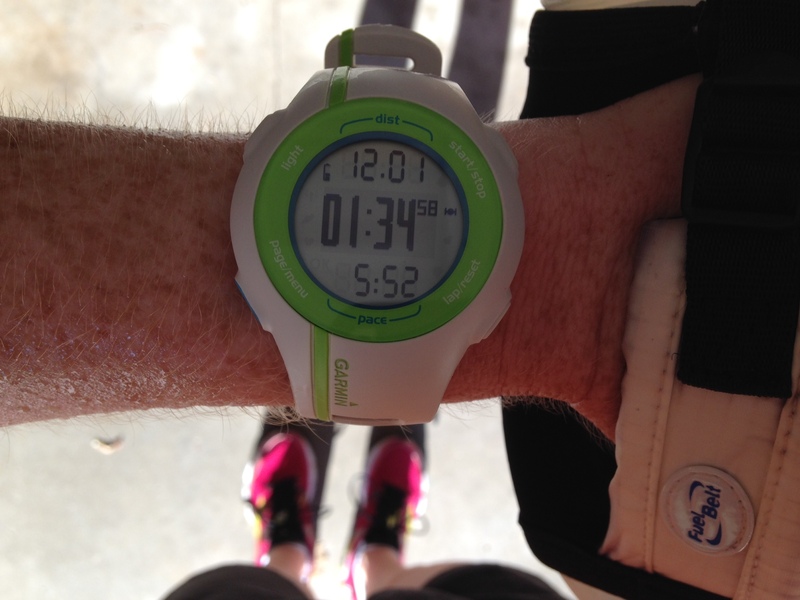 I settled in to my goal pace then and watched the miles tick by. The sun was just coming up in the canyon, reflecting off the rocks and river, and it was beautiful. Two girls were ahead of me, but I kept reminding myself that it wasn’t time to race yet, to just stick to my pace. Before long, I passed one of them, and then the only woman ahead was the one in the red Nebraska singlet… hereafter named “Nebraska” because that’s how I thought of her. Shortly after mile 10 (I think), I passed Nebraska, but I didn’t let myself get cocky: I knew there was still a LOT of race ahead of me, and I needed to stick to my pace. 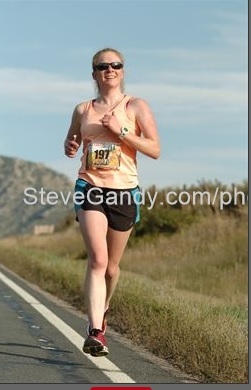 By mile 15ish (when this picture was taken, I think), I was still feeling good. 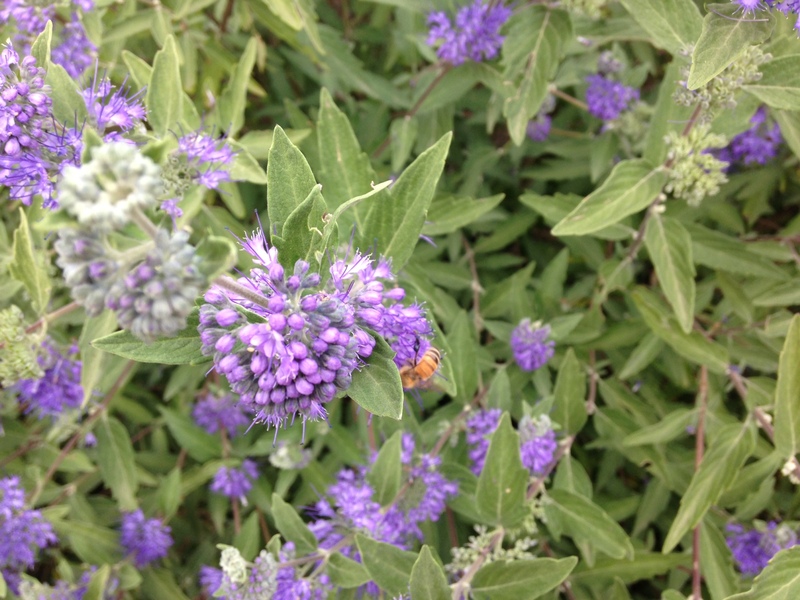 (Clearly these are the crappy thumbnail pictures sent out by the photographer. But I’m not going to pay a billion dollars for a picture, so you can look through the copyright). At mile 18ish, I started feeling the need for a bathroom. But Nebraska was still hot on my heels, so like a moron, I didn’t stop. I really thought I could push through. So I just kept going, and for a while, I did feel better. The last aid station was at mile 23, and I fully intended to stop and use the porta-john and just pray that Nebraska wouldn’t pull too far ahead. There was no porta-john at that aid station.This was bad news, but I had no choice but to keep going. Of course, this was also just about the only place on the course where there were spectators, all yelling at me, “You’re almost there! Just push through!” Ugh. I finally crossed the finish in 3:13:00 and made a (hobbling) beeline to the bathrooms. And then I cried a little, drank some water, tried to eat some watermelon, and decided that there was nothing I could do, so I should just accept the race I ran. The $400 second-place prize helped soften the blow considerably, too. Aside from the digestive disaster, I’m pretty happy with this race. I did much better at pacing than I ever had before, and I think that I do have that 3:10 in me, if all my systems cooperate. During this training cycle, I sometimes thought that this would be my last marathon, that I was ready to try something new … but now I feel like I need one more chance to redeem myself. Spring marathon suggestions, anyone? 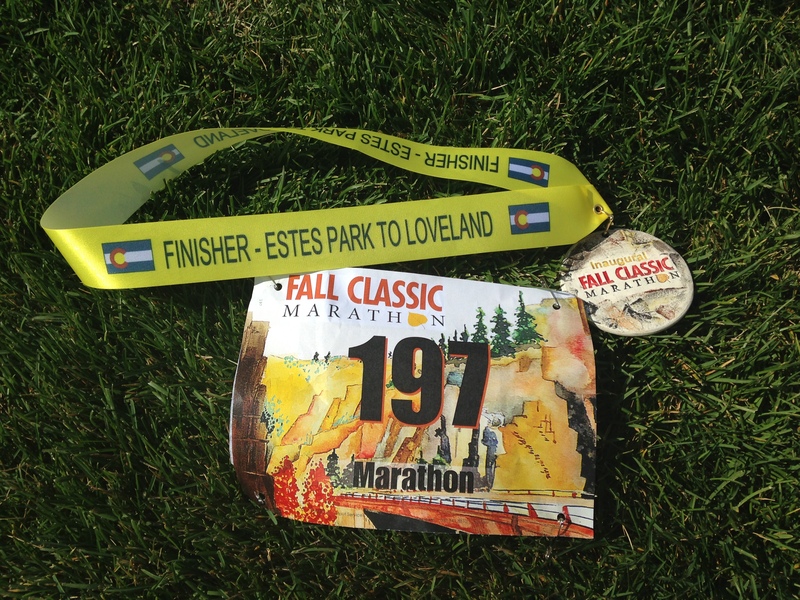 My personal race aside, the Fall Classic is a fantastic marathon, and I highly recommend it. This was its first year, so naturally it had a couple of little glitches (like the bus issue), but overall, it was very well-organized. And it’s tough to beat that gorgeous course. I was a little nervous about running down that narrow canyon road, since the road remained open, but the runners’ area was clearly marked with cones, and police were constantly driving up and down the canyon with their lights flashing to slow down motorists. I never felt remotely unsafe. My favorite thing about this race is that it 100 percent benefited locals. The entry fees supported flood victims. The aid stations were manned by local high schools’ cross country teams, who earned money for “volunteering.” The medals were created by a local artist, and the food and beer were provided by a local brewery (apparently their hand-made bratwursts were to die for. I wouldn’t know, because bratwursts are the worst. Ha. Pun). So, in a nutshell: stunning mountain course, substantial cash prizes, great organization, all benefiting the local economy. Do this race if you can. Have you ever had a race foiled by digestive troubles? Tell me your story and make me feel better about myself, please. What spring marathon should I do? So, I ran a marathon yesterday. I’ll write a full race recap and race review (spoiler alert: it’s a great race) later this week, but in a nutshell … I ran yet another 3:13 (this makes three of them) and took second place. I was on track for my 3:10 goal and the win until my digestive system decided to be a jerk. Whomp whomp. But that’s a story for a later day, and I should probably recap my final week of training. Here you go. 3.5 slow and easy miles. I planned to take a rest day, but I was at a conference all day (i.e. sitting), and my legs were stiff as boards. I had to move them. Another 3.5 miles, this time on the hotel treadmill since it was 33 degrees out and, like a dummy, I didn’t pack long sleeves. Followed by some stretching to precede another day of conference-sitting. 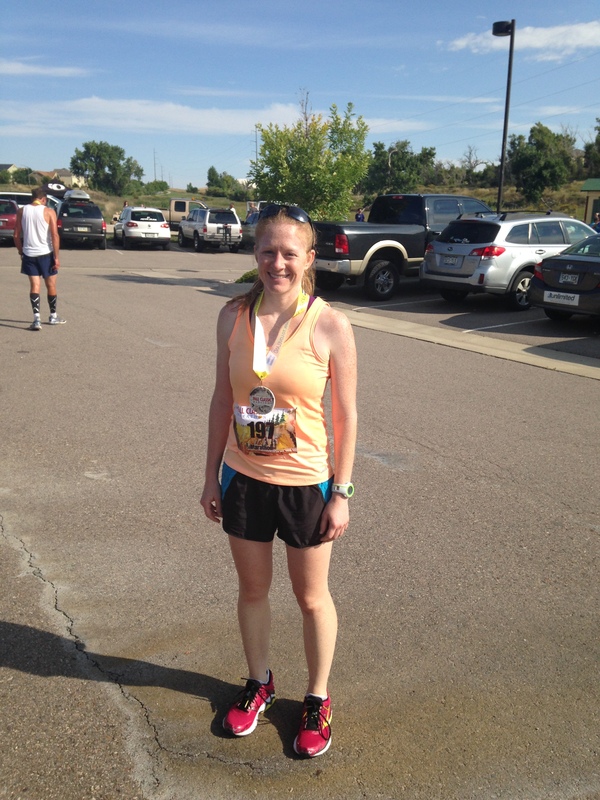 26.2 miles down a canyon. 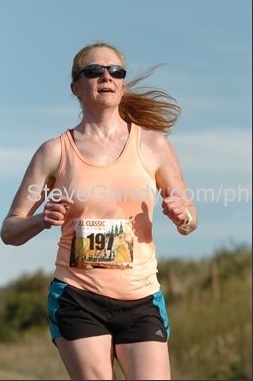 I’m hoping the official race pics are good (and borrowable), since I didn’t take any while I ran. Here’s one from after the race. This is a short and mostly pictureless blog post; sorry about that. I’m trying to summit Grading Mountain this week, and it’s leaving me short on blog time. But I promise that, unless the race pictures aren’t posted, I’ll get that recap written. It’s September now. Did anyone else’s summer just fly away? This also means that my marathon is two weeks from yesterday. To say I’m feeling less than confident is an understatement, but all I can do now is trust the training. I like to think of this past week as the first week of taper, although my mileage was equal to what I ran two weeks ago. Calling it “taper” in my head seems like a nice little mental trick to make myself think I’m relaxing. I’m rambling. Let’s just look at how the week went. PM: Full-body strength. I did two circuits instead of my usual three, because tapering made a handy excuse. Getting struck by lightning is my least favorite way to start the day, so I opted for the treadmill. PM: 30 minutes of yoga. 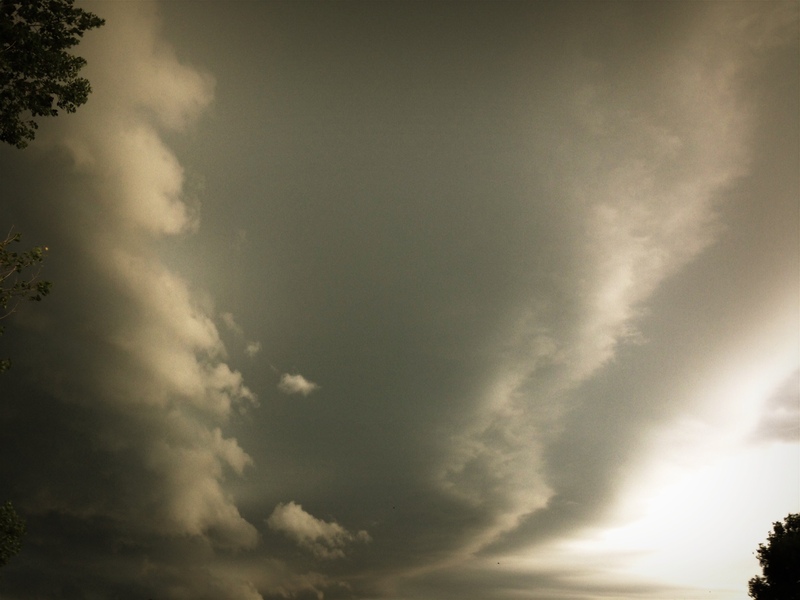 Calling it quits when I did was a great choice: I had just gotten home when it started hailing. Whew! 40 minutes of strength training. I knew I was moving my long run to Sunday and didn’t want to run seven days in a row, so I didn’t run Thursday. 8.1 easy miles — 5 on the tready and 3.1 outside once it was a little light. No PM workout because I was eating pizza with friends. Worth it. 8.2 easy miles and some abs. Then, we cruised up to Fort Collins, where we met my in-laws. My mother-in-law and I got pedicures and facials (my birthday present. I like dragging my birthday out for a month), and then we all headed up to Estes Park for a little Labor Day weekend escape. 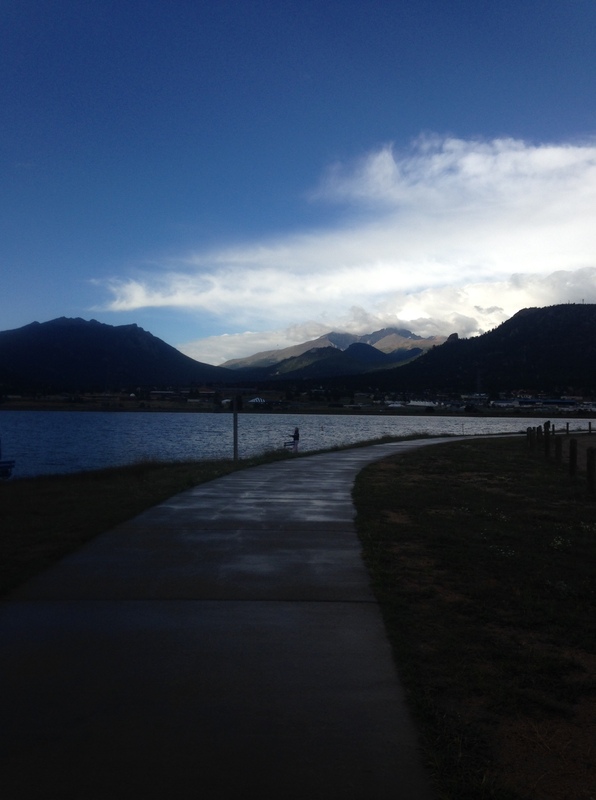 15 miles in Estes Park. I had hoped to get in one more all-downhill run before the marathon, but the roads up there have no shoulder and lots of traffic. I like living, so I opted for the bike path and rolling hills instead. There’s a rainbow up there. It was beautiful and my iPhone doesn’t do it justice. It was a fast-finish long run, and although my “fast” pace bounced around due to the hills and a random 10-minute rainstorm that blew through, I still felt good about it and finished strong. That was a nice feeling after so many tough FFLRs. Plus, I had views like this, so how bad could it be? Obviously, this was a great weekend. 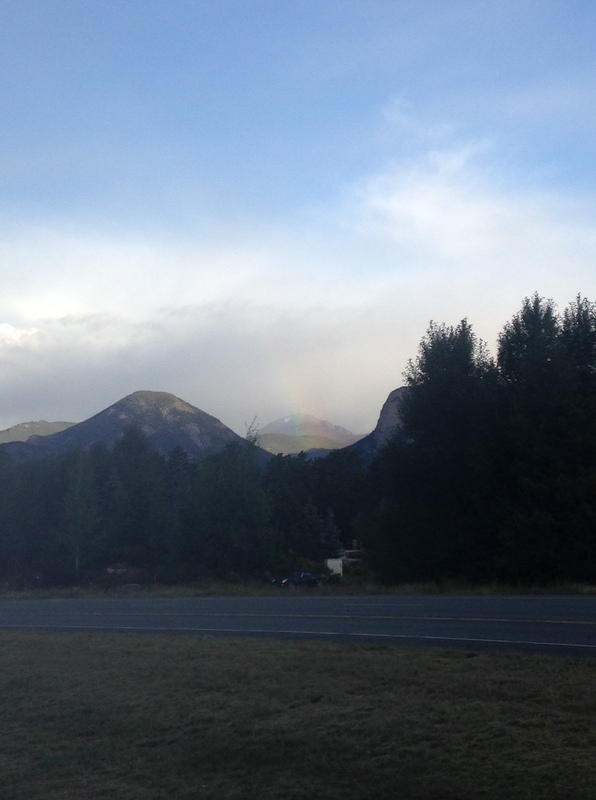 It rained off and on all day, so no mountain exploring could happen, but I love Estes and it was fun. 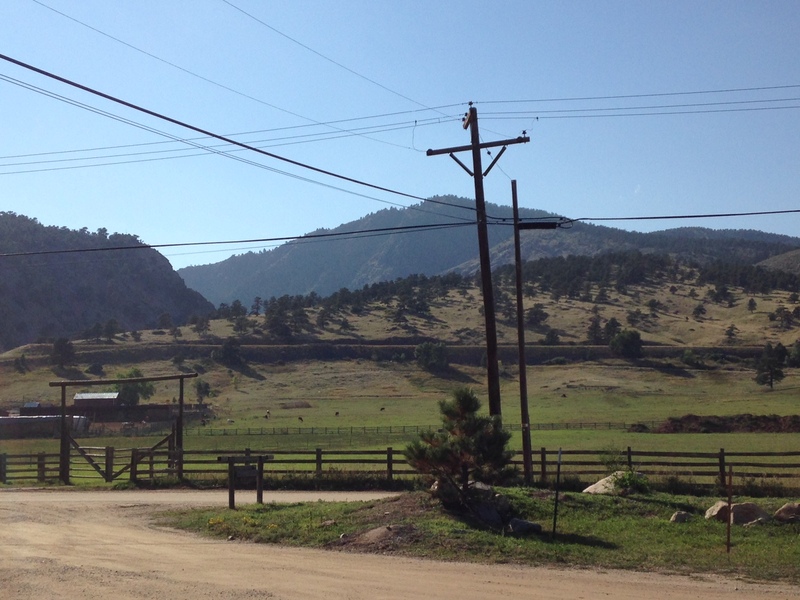 We also drove the race course (it’s the only road from Ft. Collins to Estes). I’m curious to see just how they block it off for the race. I’m also even more pleased that the race benefits flood victims. I hadn’t been up there since before last fall’s flood, and I was amazed by just how much devastation there was. This week, taper starts in earnest. I’m actually kind of looking forward to it, which is uncharacteristic. I hope that means taper madness won’t get me like it usually does!